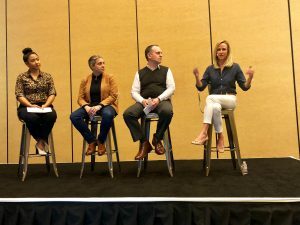 Last week at TrailheaDX I attended a session called, Demystifying AppExchange: Insider Tips for Success led by Hana Mandapat, Senior director, AppExchage partner marketing at Salesforce. The session included Jennifer Mercer, our CEO at Metazoa, J.J Jakubik, Chief Architect at Vlocity and Dory Weiss, VP of Engineering at nCino. Jennifer Mercer explaining our partner success story. The purpose of the session was to provide partners and potential partners tips and success stories from fellow partners who are currently listed on the AppExchange and leveraging all that the program has to offer. One of my favorite bits of information from Hanna was the fact that 87% of Salesforce customers use AppExchange apps! That is a significant number since Salesforce is the leading CRM platform with over 150,000 customers worldwide making it a competitive advantage for any entrepreneur with a great app. Along with being able to leverage the power of the AppExchange and the ecosystem, Salesforce has a fantastic partnership program that helps drive success by providing training, expert support, documentation, co-marketing opportunities, and a large online community that shares knowledge and experience with others in the community. Each panelist shared some of their background on who they are and examples of success from their partnership with Salesforce all with a consistent message of how powerful the platform is making it a no-brainer to build on the platform rather than recreating the wheel. Leveraging the Salesforce partner team has allowed all the partners to create roadmaps with bi-directional input from the Technical Evangelist (TE) team for better positioning and certifications for their development teams. Hanna pointed out that the Metazoa story is a unique story that truly validates the power of the Salesforce ecosystem. Jennifer explained that we were initially a company called DreamFactory and the first partner on the AppExchange in 2006. We had about a dozen apps on the AppExchange, but Snapshot was by far our most widely used product. With the success that we were receiving on the AppExchange, we garnered a lot of attention from the VC community. Our VC’s encouraged us to branch out which we did with an API platform. Ultimately, we ended up with two very different sides of the company. Eventually, both parts of the business were acquired. Metazoa, the same team behind the original Snapshot, acquired the snapshot product and all assets, and had a major relaunch with snapshot 2.0. Hanna asked the panel what was next and how they intend to move forward with the partnership. All three partners said they would be moving forward following the Salesforce trajectory, with a focus on new tools, and technologies. Here is a great article that highlights the session in more detail. Snapshot is a rich desktop application that generates metadata reports, deploys changes from sandbox to production, provides compliance and security reporting, cleans up unused assets, and tracks configuration changes over time. It is also compatible with Salesforce DX allowing for the creation of scratch orgs on the fly, and integration with developer projects and repositories for building second-generation packages. To learn more or get a demo, contact us by email, [email protected] or call +1 (833) METAZOA (638-2962).